← How shall we look when we are Damned? William Smith married Jeddy Grant’s sister, Caroline Amanda Grant in 1833 connecting the Smith and Grant families closely. In Victorian symbolism, a dried white rose had an unmistakable meaning: better be ravaged by time and death than to lose one’s virtue. While Mormon leaders insisted that their plural marriage was heaven-sent and honorable, Rachel, like most women of her generation, initially rejected the practice. She was, in fact, the quintessence of the nineteenth century’s prevailing feminine ideal. Jedediah Grant campaigns for Joseph Smith as a presidential candidate. May 1845 – Caroline Grant dies, leaving William Smith a widower. 1846 -47 – The Bulk of Nauvoo’s population head west following Brigham Young. About 1/4 follow James Strang. A few remain behind in Nauvoo such as William and Emma Smith. 18 May 1847 – William Smith marries Roxie Ann Grant, Caroline’s younger sister, by whom he had two more children before they separated. This close connection may explain why William approached Rachel Ivins; and it reminded her to go west and meet up with Jedediah Grant. May 4 and 5 1849 – George D. Grant presides at a gathering of saints at Pidgeon Creek. 1853 – Visited by William Smith back east. 1854 – Jedediah Grant added to the First Presidency under church president Brigham Young. 1856 – Mormon Reformation begins. October 7, 1856 – The first rescue party to save the hand cart companies left Salt Lake City with 16 wagon-loads of food and supplies, pulled by four-mule teams with 27 young men serving as teamsters and rescuers. The party elected George D. Grant (heber J. Grant’s uncle) as their captain. 22 November 1856, – Rachel has her son, Heber Jede Ivins Grant, nine days before “lung disease,” a combination of typhoid and pneumonia, took Jedediah Grant’s life at the early age of forty. Heber was named by Bishop Woolley, who performed the blessing and said he knew he’d be an apostle: Preston W. Parkinson, The Utah Woolley Family (Salt Lake City: Deseret News Press, 1967), p. 126. The christening is recorded in the Thirteenth Ward Historical Record, Book B: 1854–59, 1 Jan. 1857, Church Archives. 17 February 1858 – Rachel remarries for her religion and her son: Brigham told some of Jeddy’s wives to marry George Grant, Jeddy’s brother, as their new husband, they would successfully raise their children She married George on 17 February 1858, resolute in her religious obedience and hopeful for the future of her son to be a faithful Mormon. 1860 – President Young dissolved the two-year-old marriage, but Rachel’s hurt never entirely healed. “It was the one frightful ordeal of my mother’s life and the one thing she never wishes to refer to,” Heber remarked in later years. 1864 – For several years she and her son remained at the Grant home on Main Street with a couple of the other widowed and now divorced wives. But the lack of money forced the sale of that property and the break-up of their extended family. With President Young’s permission, Rachel took her $500 share of the transaction and purchased a cottage on Second East Street. 1869 – About five years after moving to Second East Street, Rachel began serving meals to boarders out of her small basement kitchen. Alex Hawes, a non-Mormon New York Life insurance man, helped make her venture successful. Attracted by her intelligence, charm, and culinary skill, Hawes first boarded and then at his own expense outfitted a small room at the Grant’s for his use. His rent and warm testimonials to Rachel’s cooking provided her, as the boarding business increased, with a growing margin of financial security. In addition, Alex would teach Heber the ins and outs of selling fire insurance. 1871 – At the age of fifteen, Heber J. Grant joined the insurance firms of H. R. Mann and Company as an office boy and policy clerk. After business hours he marketed fire insurance. He is also made a member of the 70. 1875 – By nineteen, Heber J. Grant had bought out his employers and organized his own successful agency. 1876 – During his early twenties Heber broadens out into other business activities. 1879 – At the age of twenty-three Heber J. Grant is called to preside over the Tooele Stake. 1880’s – successively saved ZCMI, the Salt Lake Herald, and the Utah Sugar Company from their respective problems. He was one of five Saints who raised the legal and lobbying fees for Utah’s statehood drive. May 26, 1884 – Married polygamously, Augusta Winters. She was reputed to be the ablest and highest-salaried schoolmarm in the territory. In the late 1880s Augusta took up residence in New York City to try and prevent Grant’s arrest on polygamy charges. Augusta bore one daughter. She accompanied Grant to Japan when he was sent to open the Japanese Mission in 1901. She would often travel with him when he was president of the church, especially when he went to address non-Mormon audiences. She died in 1952. Emily went to England to live at the LDS mission home to have her first child. She returned to the United States 16 months later and moved between multiple locations in Utah Territory and Idaho to avoid capture. April 1886 – Heber J. Grant drafts his half-brother Hyrum into organizing the Grant Brothers’ Livery and Transfer Company and began a furious war to control the local cab and transfer business. The local cab drivers were opposed to the Church, and Grant had a difficult time arranging carriages when Wilford Woodruff’s wife died. Hence he organized a “faithful” cab service. 1889 – Trying to avoid being forced to testify in pending unlawful cohabitation charges against her husband, Emily went to Manassa, Colorado, where she stayed for a year and a half. Grant accompanied her on the train-ride from Pueblo to Manassa, having been on a different train on the previous part of the journey to avoid arrest. Grant stayed two weeks, setting up for Emily the most comfortable house in the town, and leaving his mother to help Emily. :5 She remained in Manassa until March 1891 when she returned to Salt Lake City. Following the 1893 panic, when Salt Lake City’s tax collector, who also served as an LDS bishop, mismanaged $32,000 in public funds, Grant had led the campaign to pay off quickly his debts without embarrassing the church. At the same time 1,400 unruly “Commonwealers” — out-of-work Californians traveling East to protest the prevailing scarcity — were camped in Ogden City. Rachel Ivins gives her personal stocks and properties to Heber to help him through the financial crisis. 1896 – Abraham H. Cannon offers to buy controlling interest in UL&T. He wanted to use it to back a railroad to LA from SLC. His money calculations basically used the bank’s reserves to back the purchase of the bank! Six weeks later he died leaving the bank without reserves and the railroad un-backed. May 18, 1897 – Two employees, Leon Graves and Clarence Barton, who had removed $5,200 from the UL&T vaults and fled east are caught by the police in New York City. Graves was dead, and Barton was terminally ill. The money was replaced by Joseph A. West by mortgaging his home but a run on bank came from rumors. May 29, 1897 – Heber J. Grant is 90k in debt at this point. Thomas J. Stevens- brother-in-law directors and members of Ogden’s Loan and Trust company (UL&T) approach Heber to ask him to save the bank. Charles Comstock Richards and Franklin S. Richards (Sons of Ogden’s apostle, Franklin D. Richards) established the firm. UL&T paid its last dividend in 1892. UL&T officers, directors, and leading stockholders were a “Who’s Who” of Ogden’s LDS officialdom. General Authorities Joseph F. Smith and Francis M. Lyman owned stock and served as directors. Church’s loan agent in the East that because of the Ogden bank’s links with LDS officials, its failure would “almost sure” cause eastern bankers to demand payment on existing Mormon loans. Utah law made bank officers criminally culpable for receiving deposits after an institution’s liabilities exceeded its assets. Almost everyone in LDS hierarchy could be held criminally culpable if exposed. April 3rd, 1897 – The general authorities further back the UL&T on church tithe money. In case of failure, Stevens reported, “they promised to stand behind us … so that the depositors will be paid in full.” Meanwhile the Church controlled banks in Salt Lake City, Zion’s Savings and Bank and Trust Company and the State Bank of Utah, were to be asked if they would assume respectively the UT&L’s savings and Commercial banking business. Grant asks $2,500 from Alfred W. McCune, a successful mining speculator and soon to be a candidate for the U.S. Senate who was not a member. He replied “O hell, you cannot scare me with a thing like that,” when presented with the letter. Heber gave him a pity story and he wrote a check for $5,000. Heber later stoutly campaigned on McCune’s behalf, rumors came out that Grant had been bought. William H. Smart, a thirty-six-year-old Idaho livestock dealer who had been called to preside over his church’s Brooklyn Conference in the Eastern States Mission, had a niece Luella Cowley who was married to Matthias Cowley. She explained that her husband had been assigned to help save the UL&T. Smart offered between the wide range of $1,000 and $20,000. After presiding over the meetings of a stake conference, Grant typically would invite church leaders and prosperousmembers to a special meeting. After reading the First Presidency’s letter and touching upon UL&T matters (the comprehensiveness of his explanation seemed to vary with the occasion), he would then solicit an immediate and public response. “When my name was called,” complained one participant who believed that he pledged beyond his means, “I did not feel like saying that I could not or would not do anything. John Scowcroft of Ogden, gave $500 and promised to double the amount if his new business prospered. George F. Richards offered $100 (to do so he was forced to sell 300 bushels of his stored grain), the Apostle complained to Richards’s ecclesiastical superiors that he was not doing his share to save the institution which his family had founded. Grant later apologized to Richards for presuming to prescribe the bounds of another’s generosity. When one merchant grandiloquently promised “his time, his talent, [and] his substance” to the Kingdom in a public prayer [in the temple], Grant immediately closed in for a donation. Grant was upset with the man when he replied that he didn’t expect the Lord to actually take those things. 1900 – UL&T on edge of collapse again. For over a month the bank’s cash reserves had fallen well under the legal limit. “This bank ought to fix up its affairs,” the examiner wrote, “or go out of the business entirely.” Only his leniency forestalled immediate legal action. Lorenzo Snow offers tithing dollars to back bank for $30,000 to get it back to within legal reserves limits. August 31, 1900 – The UL&T bank closed up business and requested depositors to call for their money. Joseph West, recovered what he lent the bank (with interest after lawsuit). David Eccles sold the bank for 20% increase, Grant became solvent via the Sugar company. The LDS Church, which spent $50,000 (~$1,200,000) adjusted for inflation in subsidies and lost loans on the UL&T. 1902 – Joseph F. Smith reversed President Snow’s stand on alcohol being served on church properties and closed the saloon at Saltair, a move which the Protestant clergy heartily approved. Heber J. Grant had long tried to persuade Snow of this move and was key in convincing Joseph F. Smith. June 1902 – The First Presidency and Twelve agreed not to fellowship anyone who operated or frequented saloons. In the same year, Joseph F. Smith urged stake presidents and others to refuse recommends to flagrant violators but to be somewhat liberal with old men who used tobacco and old ladies who drank tea. Habitual drunkards, however, were to be denied temple recommends. 1903 – At the age of eighty-two, Rachel Ivins retires from the Thirteenth Ward Relief Society. “I am not one,” her resignation read, “who wishes to hold on to an office when I can not do as I wish.” She thus conceded to old age what she had steadfastly refused to grant to her deafness. 1906 – A strong prohibition movement developed in the United States, centered in Evangelical Protestant groups. Elder Grant who had been part of the Reed Smoot hearings, was very aware that protestants saw the saints alcohol consumption as a reason not to allow them into U.S. Politics. December 1907 – Reverend Dr. George W. Young of Louisville, Kentucky, assistant general superintendent of the Anti-Saloon League of America, come to Utah and start the Utah Prohibition movement. 1908 – Emily H. Wells dies, (Frances, Emily, Grace and Martha Deseret were her surviving children) Augusta raises Lucyh’s family while Emily’s younger children (Frances and Emily) were brought up by older sisters. 1916 – Heber J. Grant becomes president of the Quorum of the Twelve. He places himself in the forefront in the drive for Utah prohibition and led several of the state’s World War I Liberty Bond drives. November 1918 – Heber J. Grant becomes Prophet (until his passing in 1945). WWI ends on Nov 11th. Farming and agriculture, two of Utah main industries, slumped badly after World War I and deteriorated still further in the Great Depression of the 1930s. 1919 – Prohibition is adopted by 26 states. 1924 – Benjamin F. Grant, Heber’s half-brother, becomes general manager of the Deseret News. His story is really quite fascinating including his mother leaving the church when Jedediah died. He was abandoned by his mother as an infant and apprenticed to a stern and heavy-handed Cache County farmer at six, the boy fled to Montana as a stowaway in a freighter’s wagon at the age of twelve. The lad then traveled throughout the West as a miner, cowboy, and laborer. When B. F. arrived back in Salt Lake City at the age of about fifteen, Brigham Young extended a helping hand, giving him work and schooling. But it was not until B. F. was about forty, after bankruptcy and thoughts of suicide, that he returned to the faith of his father. B. F. concluded his career as a convincing preacher to wayward youth, as Salt Lake City’s chief of police, and then in 1924 he became general manager of the Deseret News. 1937 [Updated 12/19/2016 used to say “visits the Nazi Party”] – Heber J. Grant visits a gathering of saints to build relationships two years before Germany would invade poland. He reassured the Mormons that they should remain in Germany and build up the Church there. He promised them safety if they lived righteously. Because of missionary success, Germany was divided into two missions during this visit, West Germany and East Germany, headquartered in Frankfurt and Berlin respectively. The head of the Berlin Mission would spend missionary funds to hob-nob with the officials of the Nazi Officialdom. 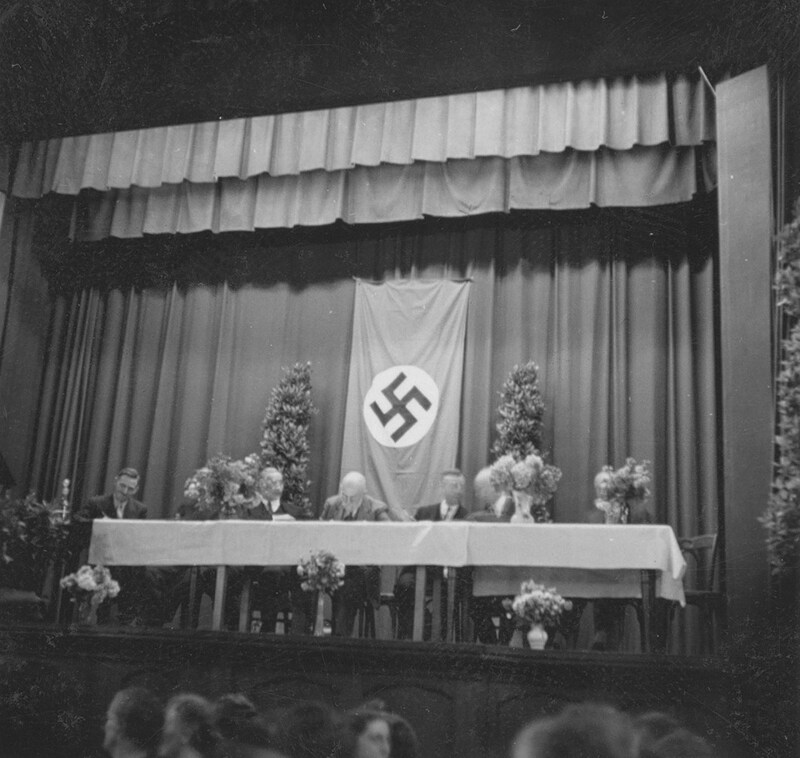 In Moroni and the Swashtika in the Chapter “The Quintessential Political Mission President” it is made clear that the mission was to align itself with the Nazi party including meeting and talking to those who created the racial psuedo-science. August, 1939 – only one week before Hitler invaded Poland, all 150 foreign missionaries were withdrawn from Germany, and the members took over all the work. Joseph Fielding Smith, an Apostle and future President of the Church, prophesied that all Mormon missionaries would escape Poland and Czechoslovakia without injury and that the war would not start until they were all out. The last Mormon missionaries left Eastern Europe on August 31, 1939. Hitler’s army invaded Poland the very next day. 1941 – Harold B. Lee called to Quorum of the Twelve Apostles . He is 31 years old. If I were still in seminary and taking notes, next to Heber J Grant I would have written teetotaler, vegetarian, Nazi sympathizer, fundraiser, insurance salesman, world traveler. I had no idea. If they would quit sanitizing history, maybe more of us would pay attention in class. This timeline reads as a great novel. “1893 – fire guts the building of the UL&T”: I wonder if they had fire insurance? They did not; which is part of why, I think, they went to Heber J. Grant (or they didn’t have enough). He had probably approached them about buying some, and then they came to him for assistance later. But if they’d had a fire insurance policy the whole thing wouldn’t have been such a terrible disaster. thank you for pointing that out. whoops! This is well put together. I would like to know more about the Poland missionary prophecy. Thank you for your work! “make sadherence”… you might want to correct the typo.